Etiquette differ from country to country in the world, and as the largest country encompassing around 1/8 of Earth’s land, Russia certainly has its own set of etiquette. Due to its size, Russia was able to incorporate both Eastern and Western values to its society. This may confuse tourists, immigrants, and visitors, as at first glance, the values may seem strange, redundant, unnecessary, or rude, but they are a part of the highly unique Russian culture, and you might do well to know it. Here are 5 etiquette in Russia you’ll need to know. 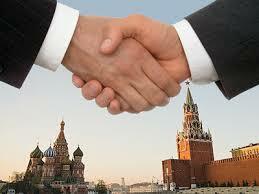 If you are a man, be prepared for a bone-crushing handshake if you meet someone in Russia, as that is how Russian men greet each other. Specifically, both men shake each other’s hand with a firm grip while looking straight into each other’s eyes. If you are a woman, the man will use a gentler grip, but the aspect of looking into each other’s eyes remain. Make sure to remove your gloves before greeting in this way if you are out in the winter, however, or you might be perceived as rude. If you’ve heard that Russians greet each other with a bear hug and a kiss, it is true. However, that is a greeting only reserved for extremely close friends, family, or someone who came back after a long time away from home. See Common greetings in Russian for words you can use as a greeting. If you meet someone for the first time, greeting them with the first and middle names is advised, as it is a sign of respect. Until the two of you are decently close and invited to do so, refrain from calling with only first names since it can be seen as rude. For women, sometimes they give an altered form of their name to their man, this “affectionate” form of her name usually ending with –a. This is a sign that she sees you as a good potential marriage candidate. For more facts about women, see 5 Facts about Russian Women. A gift of bread and salt, accompanied with a hug, is sometimes used as a ceremonial gesture of welcome. This gesture is said to be very highly regarded, shown with quotes such as “Even the Tsar does not refuse bread-and-salt.” Bread is believed as a symbol of wealth and well-being, while salt provides protection from evil spirit. Nowadays, this is mostly seen in important ceremonies such as weddings. Do not whistle in public, as it is said to invite poverty and a hallmark of poor financial situation. It is also considered especially rude and insulting to point at someone, and the proper way to call someone is using your whole hand, by letting your palm face down and move four fingers (minus the thumb) downward at once. Be careful and never let your soles be seen by anyone or come in contact with anything as it is considered extremely dirty and rude. Be careful of your stance, as well. Do not put your hands in your pockets and stand improperly as it is considered a sign of laziness. Never put your leg on your ankle while you are sitting, for much of the same reason of not showing your soles. Lastly, be careful with your smiles, as too much smiles can be seen as a dishonest or insincere gesture. It is a Russian tradition to serve plenty of food at the table to indicate there is an abundance of food for the family. In return, guests are expected to bring gifts in accordance to the type of household they are visiting. Men are expected to bring flowers with an odd number of petals and colors other than yellow (13 petals is considered unlucky, and even number of petals are for funerals), while a home with children expects guests to bring appropriate gifts for the children such as candies and snacks. Do not give anything to babies until the baby is born as it is considered bad luck. Sometimes, there might be protests such as “you don’t have to!” The appropriate reaction to this is offer the gift again and it will be accepted. It is customary to remove your coat and shoes before entering a home, and sometimes you might find that the host would rush to fetch you a pair of slippers. If you are invited to eat, be careful not to stuff yourself far too much, as you are expected to eat a portion of each course of meal or risk upsetting your host, and then socialize with the family. There is also a grain of truth about Russia’s fondness of vodka, as you might be asked to drink a glass to the brim. For this reason, take note of your alcohol tolerance. This is something that is taken relatively lightly in many parts of the world. Russia, however, highly values sincerity, and if you express something you have to absolutely mean it. This can lead to an awkward situation if you praise too much, as too much sincere praises can be interpreted as a desire to have the thing you praised (and it would most likely be given, if able). This can lead to an extremely awkward situation. To avoid this, it is a sign of good etiquette to watch your praises. It might seem that Russians are willing to talk about the political goings in their country, and in many countries joining in is seen as something normal and even encouraged. However, it is known that Russian people is proud of their country, and speaking ill about the country as a foreigner is highly ill advised and seen as inappropriate. If you want to show interest to the country, show it by learning and talking about the language, art, and history. It doesn’t have to be perfect, and Russian people generally greatly appreciates an attempt to learn even if you are only able to utter a few phrases.